It’s time to talk about your tires. When is the last time you looked at them? Even a glance? Have you checked your air pressure this month? This year? Ever? Are you driving around with your tire warning light on? Our Fort Myers car accident attorneys have posted recently about the risks of bad-weather traffic collisions. The remainder of the rainy season will bring frequent torrential rains, high winds and flooded streets and neighborhoods. But if you are driving on old or poorly maintained tires, you are at even higher risk. The truth is that your tires have a major impact when it comes to accident avoidance — and this is true rain or shine. Longer service times on today’s vehicles mean your mechanic has fewer and fewer chances to keep you out of trouble. And Florida’s hot summer weather leads to blistering road temperatures, which can drastically degrade your tires, particularly if they are already worn or improperly inflated. There have been many, many cases of dangerous and defective tires in the marketplace. The Ford/Firestone lawsuits of a decade ago resulted in billions in losses and damages for the two companies after nearly 300 people were killed, primarily in rollover collisions blamed on defective tires installed on Ford SUVs. Thousands of tires are recalled each year in the United States, but vehicle owners respond in fewer than half of all cases. In other cases, a mechanic or auto-repair shop may be at fault for improper selection, mounting, balancing and installation of your tires. In such cases, victims can pursue damages through negligence claims and product liability litigation. The U.S. Tire Manufacturers Association is among the organizations that offer tire recall lookup websites. But every motorist faces tire risks, even in the majority of cases in which tires have been properly manufactured, selected and installed. Failure to preform routine tire maintenance will shorten tire life, increase the risk of a blowout and significantly increase stopping distance and reaction time, particularly in inclement weather. The National Highway Traffic Safety Administration estimates more than 11,000 tire-related traffic crashes occur each year in the United States, claiming more than 700 lives. Size and Type: Don’t assume your tires are correct. Especially when purchasing a used vehicle. Tires are expensive and a previous owner may have selected a cheaper alternative. Even when buying new tires for your current vehicle, check the owner’s manual for manufacturer’s specifications. Tire pressure: Under inflated and over inflated tires are the number one risk on the road. Poor handling, poor gas mileage, increased tire heat and tire wear are all consequences of improperly inflated tires. Check your tire pressure when your tires are cold (before driving) as road heat will increase pressure. Check tire pressure monthly. Tire wear: Uneven tread wear (typically along the edges) can be reduced with proper tire balancing and routine tire rotations. Tires sold in the United States must be manufactured with wear bars (see picture). 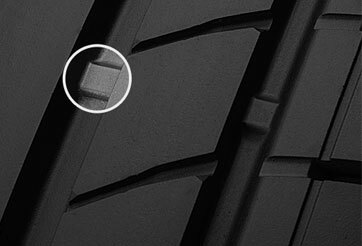 Once tire tread wears even with the wear bar, your tires need replaced. Visible wire mesh or sidewall bulges should be considered tire emergencies and mean your tire needs replaced.